Our community has 3,116 members, 106 online now. We’ve published 9,780 stories, shared 8,327 images, made 10,348 blog posts and written 121,546 forum posts. Cassie twitched. She jerked to the right and, fingers flexing, clawed the metal-tipped armrests before her hands flopped limply onto her lap. Light infiltrated her closed eyelids; swirls of colour that expanded and deepened, driving away the dense shadows of sleep. Feelings – a jumble of emotions with no apparent source – ebbed and faded, leaving behind disjointed remnants of panic and fear that fluttered inside like a startled bird. Her skin prickled and the hairs on the back of her neck rose as if invisible phantoms were leaning close, whispering her name. The light intensified and, breaking free from the binds of slumber, Cassie reached for the shimmering beacon piercing her consciousness. She drifted closer then, panicked, kicked out, arms and legs flailing. Her lungs were bursting as if she were drowning. Yet, when she gasped, they filled with air. She breathed in and out, slow and deep until her body stopped shaking. Cassie’s eyes stung. Rubbing them fiercely, she forced her eyelids open. The light expanded devouring the darkness and dispersing the final fragile fragments of her dream. She blinked and swallowed hard. Her throat was parched and she gagged at an unpleasant metallic taste. She wrinkled her nose at the acrid tang in the air. Air conditioning. The taste, the smell, was air conditioning and a low, droning buzz irritated her ears… I’m on a plane. Eyes suddenly wide, she grasped the armrests, damp palms pressing hard against the plastic with its cold aluminium ends. She held tight while her heart hammered wildly against her ribcage and sweat beaded her brow. The voice was familiar and, through bleary eyes, Cassie saw a face loom into focus. A broad smile blossomed beneath the rather angular nose. “Yes, you are.” A frown creased Liam’s brow. “Celebrate? Celebrate what? The fact that I’m on a plane and I haven’t tried to get off yet? Joke, it was a joke,” she added when Liam didn’t laugh. Liam gave a half smile. “What you need is more alcohol. Good stuff.” He patted Cassie’s knee before leaning out into the aisle. He scanned around. “Ah ha! He waved his arms and, following the direction of his gaze, Cassie spotted a stewardess in starched red and white. Already heading their way, she acknowledged Liam, her smile immediately widening until her glossy red lips framed two perfectly straight rows of unnaturally white teeth. A powerful floral perfume arrived before her and Cassie tried not to cough when she reached over to dowse Liam’s call light. “How can I help?” the woman asked brightly, angling her body toward Liam. Her voice was polite but her over-pronunciation and the bizarre way she kept smiling as she spoke were as false as her pungent fragrance. “Sir?” Her perfect teeth glistened like polished marble. What? Objections danced on the tip of Cassie’s tongue but Liam, anticipating her protest, placed a finger to her lips. “Make it your finest,” he said to the stewardess. Cassie yelped and batted the finger away but Liam quickly replaced it. “Everything okay?” The stewardess’ smile wavered but a nod from Liam had her beaming again. “Special occasion?” she asked, glancing at Cassie. “Every minute lived is a special occasion,” Liam interjected. Liam rummaged for his wallet and took out a card. “Thank you,” said the stewardess. “Back in a second.” She spun on polished heels and trotted away, svelte figure wiggling inside her snug uniform. “No. Uh-uh.” Liam caressed Cassie’s face with the back of his hand, repeating the action when she pulled away. “It won’t affect our spending money, I promise.” Ignoring her scowl, he kissed her. “Really. It won’t,” he said, his lips brushing hers as she spoke. He kissed her again and slid his arms around her, but Cassie flinched. “Don’t.” She nervously glanced around. The two women in the row opposite were looking her way and a middle-aged man in the row behind winked at her. Blushing, she shrank back. “Too public,” she whispered. Liam! Cassie, cheeks reddening, watched the women glower but the man in the row behind nodded vigorously. “Champagne, eh?” he said. “Good plan.” Standing clumsily, he pressed his call button. “Excellent plan.” He beamed at Cassie who immediately ducked out of sight. It was indeed. Through the gap between the seat backs, Cassie watched the prim stewardess strutting towards them, a polished ice bucket and two champagne flutes clutched in manicured fingertips. “Shall I pour?” the stewardess asked all smiles. Cassie pursed her lips. Breath held, she watched Liam pay for champagne that probably cost every penny he had. Every penny they had. “Oh, we will.” Thrusting a glass at Cassie, Liam grasped the bottle and poured. The bubbly slopped into Cassie’s glass, fizzing and popping. “Plastic,” he said, tapping a flute, “but it does the job.” He filled his glass and took a slurp. “Ooh, yes, that’s good.” He tipped his glass to Cassie’s. “Bottom’s up!” Locking eyes with her, he drained his glass, gulping the lavish bubbly like water. Cassie cleared her throat. Still, glaring, she took a hesitant sip. The champagne tickled her tongue delightfully, but the cost soured the taste. She lowered her glass. He kissed her again, the kiss lingering. It felt good and, forgetting her former reticence, Cassie kissed him back. She moaned softly and slid an arm around his neck. Champagne slopped from her glass as she shifted position. Cassie’s words vaporized as the plane lurched to the right. Her drink slopped again, soaking her T-shirt and when she slowly raised the glass, her knuckles were white. She stared, eyes wide, at Liam. Liam’s face blanched. Refusing to make eye contact, he lifted his champagne flute and gulped. His hand shook as he poured more. The plane rocked again and the engines roared. It was an instruction, not a request, and Cassie reacted immediately. “I love you,” said Liam. “Believe me when I say, I love you. You’re the best thing that ever happened to me.” He cocked his head to the side, hand floating in mid-air. Cassie’s thoughts reeled but before she could process what was happening, a thunderous bang blasted her ears and the plane tipped sideways. Cassie’s champagne flute was snatched from her hand as a tornado slammed into her, blinding her, knocking the breath from her lungs. Unimaginable forces pulled her limbs in every direction all at once, and when she tried to reach Liam, he wasn’t there; he’d gone. Cassie screamed but the sound was whipped away. Darkness enveloped her. Silence descended. Cassie twitched. She jerked to the right, gripping the metal-tipped armrests to steady herself. Light infiltrated her closed eyelids; swirls of colour that merged, the brightness intensifying until it drove away the dense shadows of sleep. Feelings – jumbled emotions – faded, diminishing traces of panic and fear evaporating like mist in the sun. But the final lingering remnants refused to dissipate and Cassie’s skin, beaded with sweat, prickled uncomfortably. She stretched, arms above her head, back arched. Ouch. Her neck hurt. She gingerly probed the tender areas then, exploring further, found bruises on her shoulders. She opened her eyelids, blinking at the brightness. Her eyes stung and, rubbing them, she found them wet. Tears? She gasped; a distant memory stirred – or was it her dream? She concentrated, trying to recall more detail but the images evaded capture, trickling through her grasp like water. Giving up, Cassie shook back her hair. She yawned. Her mouth was dry and an unpleasant metallic odour filled her nostrils. Air conditioning… of course. Tensing, she gripped the armrests. “I said, are you getting the hang of this yet?” Liam’s face loomed into focus, a broad smile blossoming beneath his rather angular nose. Cassie smiled awkwardly. Releasing the armrests, she clasped her hands together and placed them in her lap. “I’m sorry, I must have nodded off. How long…” Her brow furrowed. “Gosh, that’s…” She pinched the back of a hand, hard. Retracting the finger with a warning waggle, Liam waved to the red and white uniformed stewardess striding purposefully toward them. Her smile immediately widened, showing off her unnaturally white teeth. She caught Cassie’s eye and nodded politely as she proffered a bottle of champagne in a shiny metal bucket. She placed it on the table lowered over the seat next to Liam. “So tell her,” Cassie whispered urgently. “No, not at all.” Liam placed a hand on Cassie’s knee and held it there. “No. Thank you.” Handing his glass to Cassie, Liam rummaged for his wallet. “Special occasion?” asked the stewardess. “I quite agree, and I like your thinking. Actually,” she leaned closer, “someone else said the exact same thing just a few moments…” The stewardess’ smile wavered again and her painted eyelashes fluttered. She clutched Liam’s seatback then dabbed her brow with a manicured fingertip. “I’m so sorry. I…” She flapped her hand dismissively. “Funny turn. Silly me. Do enjoy your champagne,” she said then, spinning on polished heels, she trotted away. The stewardess didn’t turn. Peering between the seats, Cassie watched her rapid retreat, her svelte figure wiggling ten to the dozen inside her snug uniform. She soon disappeared into the galley. Cassie rolled her eyes. Still hesitant, she took a tiny sip. “I know, but you don’t have to. You can have the best.” Leaning in, Liam kissed Cassie’s lips. The kiss lingered and, sighing, he slid his arm around her body. “Liam…” Cassie glanced sideways at the two women seated across the aisle but to her relief, neither were looking her way; one was staring at the seatback in front, the other gazing around as if dazed. The middle-aged man one row behind, however, was staring straight at her. Catching her eye, he winked, raised a bottle of champagne to his lips, and glugged. Unnerved, Cassie shrank back. Liam laughed but Cassie tensed. “How do you know him?” she asked. “No.” Cassie’s mouth curved into a smile but she refused to budge. She played with a strand of hair, twisting it around a finger, then glanced at the two women again. Liam! Cheeks glowing, Cassie watched both women turn. They stared blankly then, to Cassie’s horror, the nearest woman burst into tears. Cassie gazed at her boyfriend: at his beaming smile, his laughing eyes, and that rather angular nose. Her heart fluttered. Oh, what the hell? Throwing caution to the wind, she kissed him on the lips, champagne slopping from her glass as she shifted position. “No rush. It’s fun.” Taking the lead, Liam upended his glass then he stared expectantly at Cassie. “Fun, huh? Okay.” Cassie raised her glass and knocked back her drink. Bubbles tickled her nose and she suddenly felt woozy. Giggling, she let her empty glass slip from her hand. Plastic clinked against metal as the flute hit the armrest on its journey to the floor. Cassie didn’t care. “Mmm... it is fun. Come here you.” She grabbed Liam, her mouth locking with his, lips parting. Liam didn’t answer. Suddenly somber, he lifted the champagne bottle to his lips and drank. “Hey, what’s wrong? Liam? Why are you acting like…” Cassie froze. Déjà vu, again. A cold shiver ran the length of her spine. That. Exactly that. Cassie’s blood ran cold. A resounding bang blasted her ears. Wind rushed at her face, slamming into her, blinding her, knocking the breath from her lungs, while unimaginable forces pulled her in every direction all at once. She tried to hold on to Liam’s hand but to no avail. He was gone. Cassie screamed and raised her arms to protect her face as darkness enveloped her. Silence descended. Cassie twitched. She jerked to the right and, gripping the metal-tipped armrests, opened her eyes. Her heart raced. It pounded against her ribcage as if desperate to escape. Pain shot through her shoulders and, touching the back of her neck, she winced. She swallowed hard, the unpleasant metallic taste in her mouth making her gag… No! Clasping her cheeks, she stared wide-eyed at the seatback in front of her. No, no, it can’t be. “Cass… stop.” Liam grabbed her wrist as it whipped past his face but Cassie waved her arms wildly, breaking free. Scrambling into the aisle, she cast around, seeking the nearest exit. She stumbled toward it, focus on her target, mind replaying the safety briefing on how to open the door. But in the event, she didn’t get that far. Cassie had barely moved five feet before her path was blocked by starched red and white linen, polished shoes and a clanking jumble of champagne bottles. “I can’t do that.” The stewardess stood her ground, her perfume swamping the air around her like a protective shield. Cassie shrank back. 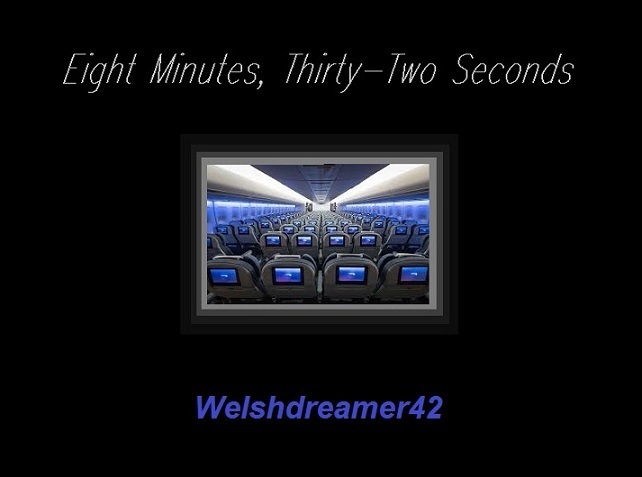 She rubbed her eyes and gaped at the stewardess’ face. The young woman didn’t look quite so pristine anymore; her eyes were as moist as Cassie’s and her make-up smudged. Her glossy lips twitched, briefly exposing her unnaturally white teeth before her smile was gone. “Sit down, Miss. If you take a seat, you can have one of these, or anything you like, on the house.” The stewardess held out a bottle. “Have one,” she urged, her voice tremulous. Tears rolled down Cassie’s face and, swiping at them, she melted into Liam’s arms. She held him, staring blankly, while Liam took the bottle from the stewardess and placed it in Cassie’s hands. He stroked her back, the circling motion warm, comforting, while Cassie stared at the bottle in her hands. The cold glass stung her fingers. “I know and I… I…” Cassie’s words faltered as fear grew deep in her belly, spreading through her body like a disease. Her heart seemed to beat ever faster, the pulse pounding in her head like the ticking of a clock. Or a time bomb. Perhaps a countdown. Yes… a countdown. And she knew what happened when the countdown stopped. She’d dreamt it. She remembered. Shuddering, Cassie scrabbled to her feet, threw her champagne aside, and bolted. She raced for the exit, smashing her shin on a chair and stumbling. She reached out to steady herself but couldn’t prevent the tumble that followed. A dozen heads popped up above seatbacks as she crashed down, sprawling in the aisle. “I understand perfectly. Relax,” he said, raising a bottle of champagne and drinking. “That was quite a fall, You okay.” Liam stood over her. “No, I’m not okay. I’m nothing like okay.” Turning her back on him, Cassie resumed her bid for freedom, crawling on hands and knees toward the exit. The plane lurched to the right. Her chest tightened, she struggled to breathe. She barely noticed Liam’s arms around her once more or the words of love he whispered over and over as she awaited a fate she knew was coming. Snapshots of her dream flashed through her mind. Horrible images. Panic growing, she buried her face in Liam’s chest. “It’s okay, it’ll all be okay,” he whispered, but Cassie’s teeth chattered uncontrollably. The plane shook. There was an almighty bang and wind rushed from everywhere, battering Cassie’s body, slamming into her while unimaginable forces pulled her in every direction at once. She tried to hold on to Liam but to no avail. He was snatched away. Screaming, she threw her arms wide as darkness enveloped her. Silence descended. Cassie twitched. She jerked to the right and, gripping the metal-tipped armrests, opened her eyes. She swallowed hard to dispel the unpleasant metallic taste in her mouth then, drawing a breath, faced Liam. Cassie looked at the two women opposite. She watched them embrace. Then, right on cue, the starched, lip-glossed stewardess strutted forward, offering free champagne. When Cassie declined, the stewardess smiled – a warm, genuine smile - and sauntered further on. Cassie watched her flop into a seat next to Joe who, relieving her of her clinking load, took her into his arms and hugged her. Cassie’s mind whirled. She touched her neck and ran fingertips over her bruised shoulders. Cassie drew a breath, her nostrils filling with Liam’s scent. She pressed her cheek against his shoulder and let his broad chest cushion her trembling body. Liam tightened his embrace and Cassie exhaled. The plane jolted. Cassie shook. Her teeth chattered. Images – horrible images – flashed through her mind. No, not images… memories. Time’s up. “I’m here,” he said, kissing her. Cassie’s heart thumped slowly… slower. Closing her eyes, she threw her arms wide and let the darkness envelop her. Cassie twitched. Light infiltrated her closed eyelids; swirls of colour that expanded and deepened. Heat scorched her and the acrid smell of burning made her gag. She coughed. Her lungs, filled with smoke, were bursting as if she were drowning. She gasped, struggling for air, and managed to pull her T-shirt over her mouth. She breathed in and out, slow and deep, but her body shook violently, refusing to stop. She hurt all over and her eyes stung. Rubbing them gingerly, she tentatively opened her eyelids. She balked at the sight before her. She stared unblinking, paralysed by the horror. “Liam,” she whispered, her throat so parched she barely made a sound. “Liam.” Reaching out, she grabbed the nearest object – something metal that scorched her – and, holding on, tried to stand. Pain shot through her. Searing pain. Crying out, she crumpled. Her head rolled back. Her eyes closed. Feeling woozy, she let them remain shut. Liam…Please. Darkness enveloped her. Silence descended. Stirring, Cassie groaned. Her shoulders hurt, so did her shin but the searing pain had gone. The foul odour of burning had gone too. So had the heat. The air was still acrid but in a different way; the taste, the smell… Air conditioning. She could definitely smell air conditioning, and there was a low, droning buzz irritating her ears… Her pulse surged. I’m still on the plane. Eyelids fluttering open, she made a grab for the armrests. Relief consumed her when damp palms pressed against the plastic with its cold aluminium ends. She turned her head, bleary eyes just making out a broad smile and an angular nose. No part of this material may be reproduced or transmitted in any form or by any means, mechanical or electronic, or used in any other fashion without the express permission of the owner.